Google, in its monthly Android distribution charts, provides us with an insight into the adoption rate of various OS versions that are being used. The Android distribution dashboard from Google has been updated and the numbers for October 2018 are out, but Android 9.0 Pie is nowhere to be seen. Last month, the mobile software market saw the release of the final build of Android P or Android Pie. While its availability is still limited, the share of Android smartphones running Android Pie was still less than 0.1 percent. However, Android Oreo (8.0 and 8.1) increased its market share from 19.2 percent in September to 21.5 percent this month. The market share of Android 7.0 and 7.1 Nougat continued to fall, as did that of Android 6.0 Marshmallow, and most previous Android versions. As per the official chart for October, share of Android smartphones running Android Pie was still less than 0.1 percent. With several companies slated to get the update soon, we might see an increase in the next few months. Smartphones such as Essential Phone, OnePlus 6, Nokia 7 Plus, Sony Xperia XZ2 and Xperia XZ2 Compact have1 already started receiving the latest update. Android Oreo’s share increased from 19.2 percent in September to 21.5 percent in October. While Android 8.0 has reached the adoption rate of 14 percent (up from 13.4 percent in September), Android 8.1 has grown to 7.5 percent (up from 5.8 percent in September). Next up is Android Nougat, which still remains the second most widely distributed Android version. When it comes to Nougat, Android 7.0 has 18.1 percent share (down from 19 percent in September), whereas Android 7.1 has 10.1 percent share (down from 10.3 percent in September). The distribution of Android Marshmallow has marginally declined to 21.3 percent in October from the 21.6 percent share in September. Similarly, in the case of Android Lollipop, distribution in the month of October has declined to 17.9 percent from 18.3 percent in September. The distribution of Android KitKat has also declined to 7.6 percent from 7.8 percent in the previous month. Likewise, Android Jelly Bean has reached 3 percent in October, down from 3.2 percent. 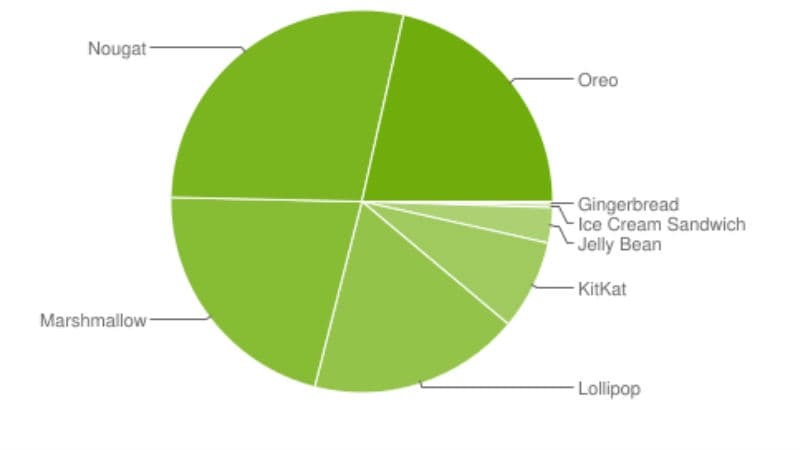 Interestingly, Android Gingerbread still owns a share of 0.2 percent among all Android devices. Google collected the Android distribution data by recording active devices visiting Google Play in a seven-day period ending on October 26. Also notable, is that Google has updated its OpenGL version distribution numbers which have OpenGL 3.2 at 35.5 percent, OpenGL 3.1 at 13.6 percent, OpenGL 3.0 at 29.8 percent, and OpenGL 2.0 at 21.1 percent.